The first batch of investors from Qatar and the Middle East has visited the Philippines to study the locations identified by the Philippine Economic Zone Authority (Peza) for investments in several sectors. Peza director general Charito B Plaza posted on her Facebook page that investors from the Middle East “are ready” to invest on agro-industrial economic zones, including a 1,000-hectare area for poultry and vegetable crops. Other projects, according to Plaza, include the development of five islands in the southern part of the Philippines where investors are planning to build a resort, retirement village, and other tourism destinations. The first batch of Middle East investors is among the 13 companies that signed letters of intent (LoI) with Peza during Philippine President Rodrigo R Duterte’s state visit to Qatar in April. Speaking to Gulf Times during Duterte’s Qatar visit, Plaza had said Mindanao would be home to most of the $206mn (P10.3bn) worth of investments Peza signed with Qatari investors. She said the investments are expected to generate 5,870 new jobs in the country. The investments range from retirement village projects, hotel and tourism ecozones, IT services and digital marketing, ecozone management services, poultry and halal food processing, as well as agro-industrial farming, and hospital and medical tourism economic zones, among others. Plaza said, “While waiting for the Peza board’s approval of their application, we can already start looking for areas and economic zones where the investors can establish their industries. Vast islands in Palawan, Mindanao, and the Visayas are awaiting development.” According to Plaza, Peza had achieved 64% of its $1bn target from its initiatives in Saudi Arabia, Qatar, and the UAE, which Duterte visited in April. “Thanks to the good economic climate and favorable conditions of the Arab investment market, I am confident that Peza can easily exceed its $1bn target earmarked for the Middle East,” she pointed out. She also said the Philippines would be an ideal distribution hub for Qatar in fields such as defense, manufacturing, and food processing due to its “strategic location” in Asia and the Pacific. Plaza also emphasized on the need for economic zones with logistics hubs, seaports, and airports, which are under the helm of the Philippines’ Department of Transportation. A number of Qatari business community members and their representatives had one to one detailed meeting with Chairman and accompanying members of Philippines Economic Zone Authority today. 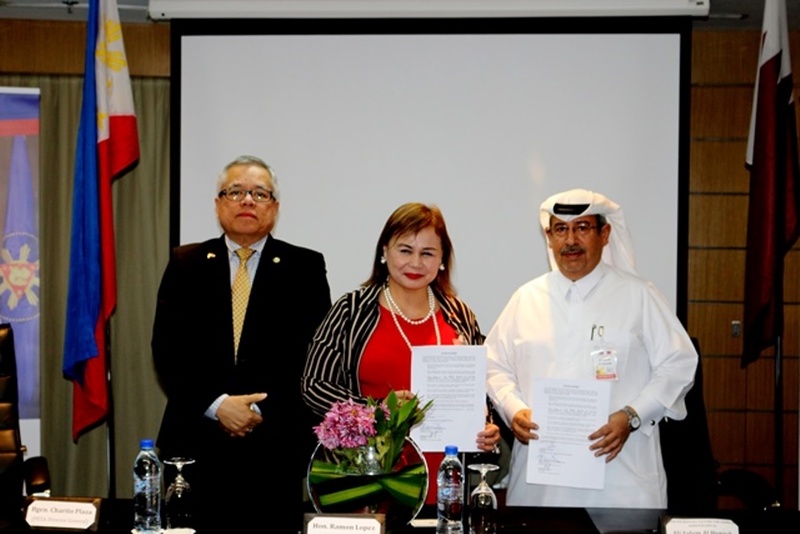 On the sideline of President Duterte visit to Qatar, a number of MOUs worth amounting to US$ 206 million were signed this afternoon between Qatari local companies and the Philippines Economic Zones Authority (PEZA). Ramon M. Lopez, Secretary (Minister) Department of Trade & Industry of Philippines was also present on the occasion and witnessed the MOU ceremony. On behalf of PEZA, Brig. Gen. Charito Booc Plaza, Director General PEZA signed the MOUs. PEZA local representatives Joseph Rivera, Greg Loayon and Adel Sa’adeh assisted in organising the signing ceremony. Philippines Trade minister and PEZA authorities are part of official delegation of President Rodrigo Duterte, who is on his official visit to State of Qatar.